Fernando Esguerra, Globe OIC for Corporate Social Responsibility, demonstrates how TxtHIV operates. With him are (from L-R): PNAC Executive Director Dr. Chito Avelino; S&S TechnologiesPhilippines President and CEO Mark Soriano; and PHANSUP Chairman Oscar Picazo. 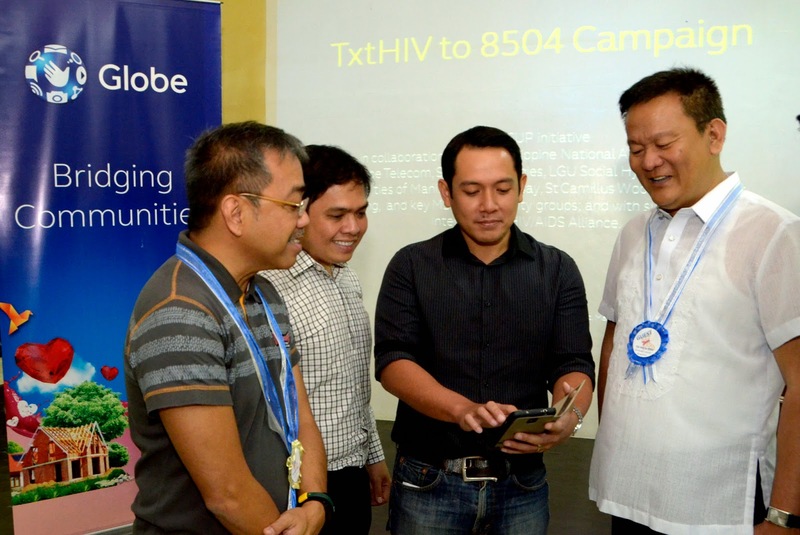 In partnership with key partner organizations, Globe Telecom launches the “TxtHIV to 8504” campaign, an SMS-based information, counselling and clinic referral drive in Asia for people who wish to be tested for human immunodeficiency virus (HIV) and STI infection but are afraid of facing societal discrimination. Globe postpaid and prepaid mobile users who are at risk may text HIV to 8504 and answer five yes or no questions via an interactive voice recording to check if testing is necessary. The sender will then be provided with contact details and addresses of the nearest specialized accredited health centers where they can go for assessment, counselling, and immediate treatment. All calls will remain very impersonal and confidential. Given the increasing number of HIV cases in the Philippines, this innovative, cost-effective and practical initiative was launched based on the belief of making health accessible to all as well as the sharing of resources and expertise.